This section of the Antiochepedia is a work in progress where we shall add notes as we go along (similar to the Temples' coverage). Thus at any given time it may seem to not encompass the topic in full, as we hope it eventually shall. The baths at Antioch were a central feature of the life of the city. When emperors wanted to punish the city they frequently resorted to closing the baths as a means of having the most immediate effect on the population. Antioch was famous (or infamous) for its bathing establishments. Chrysostom saw them as part and parcel of the iniquity of the city and Julian was also moved to comment upon the local populations' prioritisation of this feature of the urban lifestyle. The baths were a mixture of large and small establishments. Each of the 18 wards had its own baths, but many of these must have been small and funded with resources of the individual ward. Possibly some of those unearthed by the Princeton team were of this origin. The excavations of the 1930s had their best successes with public buildings when it came to baths. Emperors frequently tried to impress the local populace by building establishments that were worthy of mention in the historical texts of the day. None has been unearthed as yet that even vaguely match the grandeur of the baths in Rome like those of Caracalla or Diocletian (and presumably Trajan) with their vast acreages and soaring halls. 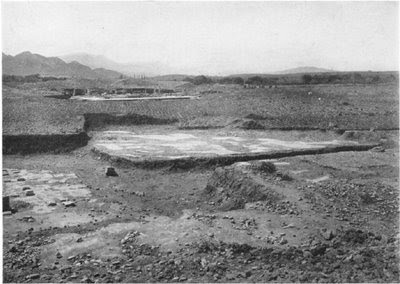 The most complete bath of substance yet discovered in Antioch is the so-called Bath C. It adjoined a "Byzantine hippodrome" as some have termed it, which looked more to me like a grandiose palestra. 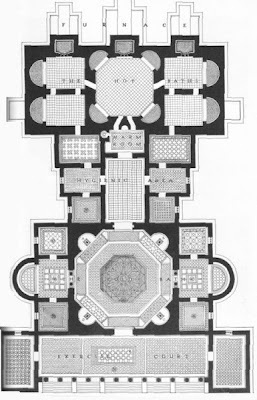 Above is a floor plan of Bath C (click to enlarge). This stood on the Island is relative proximity to the Imperial Palace. It was fully excavated by the Princeton team and represented the most complex and substantial building found in the project. It was however stripped down to its foundations by subsequent looters of building material leaving little idea of what its vertical dimensions might have been. Below is a plan of Bath E which was located in close proximity to the Hippodrome on the Island. This has been called the Bath of Diocletian in some versions. Edgar Schenck, then a junior member of the team from Princeton, was given the task in 1933 of excavating Bath D on the Island. This stood in close proximity to the presumed site of the Tetrapylon of the Elephants. Here he discovered the Hermes Mosaic, that was in a large portico surrounding a court approximately 90 m. square, which adjoined the calidarium of the bath, but was not a part of it. This portico is truly stunning in its size. To our knowledge little else has been published on the baths besides Schenck's article in the American Journal of Archaeology in 1937. The photo below shows a view across the corner of the portico. It is interesting to note how shallowly buried the site is (25 centimetres), like much of the Island. In fact the mosaics had been damaged by plowshares and plant roots. Below we reproduce Schenck's reconstruction of part of of the portico. Stinespring's translation of the Arab text from the Vatican includes the following: "....the architects made their beginning at the temple named after Mars situated east of the Arch of Fishes; and they held a fine festival of him (Mars) and planned (to repeat) it every year in his honor. And nearby they built a great bath, and in this was hot water which came forth from the mountain and (flowed along) the bed of a stream. And the people could enter it at the (annual) occasions of the festival without cost." This might be the substantial bathing facility discovered in the 1930s and termed Bath F.
The two best sources on the bathing culture are Fikrit Yegul, the Professor of ancient art and architecture at UCSB, who wrote an excellent article in Christina Kondoleon's catalogue of the Lost Antioch exhibition, and Catherine Saliou, a French academic who has written extensively on Antioch and nearby cities. Her focus was on the dichotomy between the summer and winter baths of the city. We would also note that Antioch was a different place to Rome. Commentators have mentioned the lesser role of frigidaria in the Antioch establishments. Saliou divides the baths by seasonal usage. It seems that the summer baths were grouped on the slopes of the mountain with views over the city. These sound more like the public pools of modern day cities than the hammans of the modern Middle East, which almost certainly have their roots in the "winter" baths. The great advantage that Antioch had over so many other Roman cities was its copious sources of water in close proximity (4-5 miles), particularly the springs at Daphne from which Hadrian built his aqueduct. The aqueduct skirted the lower slopes of the mountain (both above and below ground) and could bring enough water to provide the baths, public fountains and the private homes on the system. Boucher comments upon the reigns of Septimius Severus and his son Caracalla: "Some new buildings were constructed, as the public bath Severianum and another, probably beyond the river, called Livianum from a former owner of the site, and established by the magistrates, on Severus' suggestion, from surplus revenues". Catherine Saliou quotes Malalas as indicating that the Golden Octagon was built over the demolished "thermes de Philippe". The location is not known. We discuss the Octagon's possible locations in our article on the subject. Adolf Holm in his History of Greece reports Posidonius' remark, that the inhabitants of Antioch in their luxury used the gymnasiums as baths, alludes to the fact that they were the first to combine bathing establishments with grounds for physical and intellectual exercises, in other words that they were the originators of the thermae established on such a grand scale in later Rome. Fikret Yegul states that Agrippa built two baths, one in the quarter named after him and another near a spring in a lush quiet setting on the slopes of Mt Silpius. To support this latter baths he quotes Malalas 222.17. 20). We wonder whether these might just be one and the same baths. He also enumerates a list of other baths, including those of Julius Caesar, Tiberius, Domitian, Trajan/Hadrian, Commodus, Septimius Severus, Diocletian, Valens and Governor Olbia. He gives conjectural positions on a map of the city. As we already noted Bath E has been thought to be the baths of Diocletian, but Yegul's map has them nearby but on the other (as yet unexcavated side) of Hippodrome. We have seen comments elsewhere (Kennedy) that Bath F was believed to those of Tiberius and yet Yegul has the baths of Tiberius outside the city walls in a zone thought to be that of Agrippa's new town. He cites these as being served by a mountian spring called the Olympias though this sounds rather like the Spring of Saint Paul which we had heard of being the source of the Baths of Agrippa. Anyway, he goes on to note (according to Malalas 263.11-17) that the Baths of Domitian were located on the lower slopes of the mountain in the more southern quarter near the amphitheater of Julius Caesar. The Baths of Trajan (which were rebuilt by Hadrian after the earthquake of 115 AD) were the first connected to a major aqueduct (which is now named after Hadrian) according to Malalas 276.1-3, 277.20, and 278.19. He places the Baths of Commodus (the Commodion) near the Forum of Valens in close proximity to the Plethron and Xystos (which we have dealt with elsewhere). He also mentions the baths of Septimius Severus and the Livianum. He places the former near the branch of the Orontes separating the bulk of the city from the Island. He cites Malalas as attributing no less than five bathing establishments to Diocletian. We already mentioned the discrepancy of views about whether Bath E is one of these. The Baths of Governor Olbia he places next to the basilica of Rufinus near the Hellensitic Agora, somewhere in the vicinity of the Forum of Valens. We remain unconvinced of the Agora being where he, and others, put it. We cannot grasp why the Hellensitic Agora (which may be associated with the Regia which we deal with elsewhere) isn't inside the original "Old City" of Seleucus. It is relevant to also quote Roland Martin, who wrote a supplement to Festugiere's work. This insert was an archaeological commentary on Libanius' Antiochikos. He says of the Libanius' mention of the baths " l'abondance des etablissements de bain constitue un de les aspects les plus notables d'Antioche, revele par les textes (K.O.Muller, Antioch. Antiq., passim) et confirme par les fouilles. De nombreuses installations ont ete rencontrees para les sondages. Dans la Nouvelle Ville seule, pas moins de cinq edifices balneaires ont ete reperes: les bains A, B, C, D et E parmi lesquels se trouvent les thermes de Diocletian, construit pres de l'hippodrome (Malalas); ce pourraient etre les bains E ou C."
This speculates that either Bath E or C might be those of Diocletian. He then goes on to interpret Libanius' cryptic comment on the baths being "suspended in the airs" metewra :des deux sens du mot, le plus repandu est "a ciel ouverte" (cf. R.Martin, Rev. Phil., 1957, p.66-72) et pourrait s'appliquer a des piscines ouvertes, par opposition aux etablissements fermes ou chauffes, precedemments cites. Le deuxieme sens "a ciel ouverte", "surelevee" parait mieux convenir a la suite de l'expression. Il faudrait alors entendre des piscines amenegees sur terrasses, dispositif convenant peut-etre a des bains prives, mais non atteste pour des bains publics". This raises again the issue of hillside baths. 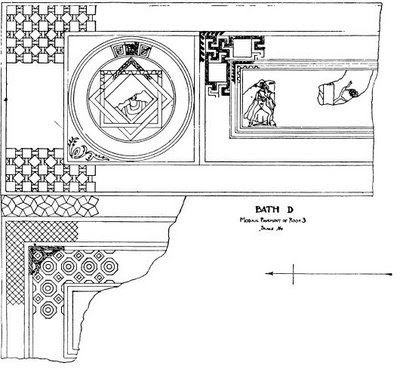 Downey in his piece on the Antiochikos cites Evagrius (VI, 8) as mentioning baths at Antioch designed especially for use in the summer or in the winter. He comments that such establishments seem to have been fairly common, perhaps especially in the East; (Amer. Journ. Archaeol- ogy 41: 200, n. 3, 1937, and Antioch 2: 208, n. 13; 211, n. 25.). Clive Foss in Syria in Transition comments that Bath F, a large bath of the lavish kind that adorned Roman cities, stood near the wall below the slopes of the acropolis. It bears a mosaic with an inscription that calls it the demosion and shows that it was restored from the foundations in 538 AD at which time a pavement of opus sectile was also added. The restoration had hardly been finished when the whole building was destroyed by fire in 540 AD and abandoned. However, we note that Bath F was nowhere near the acropolis, it was off to the west of the colonnaded street on the way to the Beroea Gate and on the flatlands, not on any slope. He also comments of Bath C that it was ruined in an earthquake and then looted for building material with a limekiln being installed in the ruins to break down the material. He notes that Bath A, near the Orontes, was filled with debris and rubble walls. Saliou reports that Caligula sent two senators, Pontius and Varius, to occupy themselves with the rebuilding of the city. Varius apparently orchestrated the construction of a baths which had his name (the Ovarion). A complex of official buildings was built around it and the whole area eventually took his name. She cites Malalas as the source and sites the district "near the ramparts, along the Orontes". It is not clear if this zone is on the Island (probably the far north end that has never been looked at much) or somewhere near where the northern stretch of the walls meet the river (and its branch). Saliou speculates that the interpretations of the PIANA part of the Megalopsychia mosiac may be referring to this district and not the Taurian Gate as others have guessed. aqueduct water - was there an extension of the main city aqueduct that ran out to the Island jumping over the river branch to service this area and its baths? If there wasn't then this area would have been the "disadvantaged" part of the city considering how highly the inhabitants prized their running (and pure) water supply. Where might this have been? Was it destroyed in an earthquake and cannibalised for stone? Aqueduct water would provide pressure (for fountains etc.) whereas the other two means would not.